The Fan’s Choice for Kpreps Game of the Week featured a pair of unbeaten Class 3A teams in No. 2 Rossville and Centralia. After falling behind early, Rossville scored 42 unanswered points to beat the Panthers 42-6. Rossville junior quarterback Tucker Horak had a huge performance against the Panthers in accounting for more than 300 yards of total offense in the first half as the Bulldogs built a 35-6 lead. 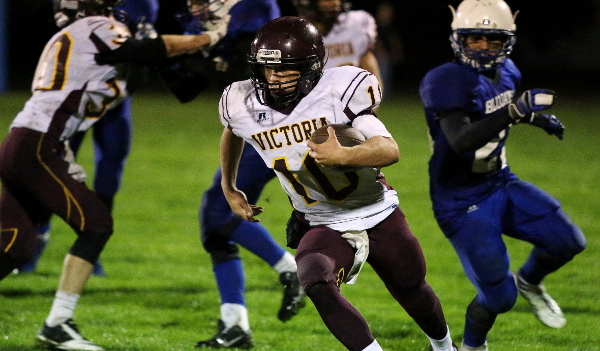 For the game, Horak rushed for 219 yards and three touchdowns and passed for 206 yards and two more scores. Centralia’s Wyatt VanDorn topped the 100-yard mark with 106 yards, but 59 of those came on his first quarter touchdown that put the Panthers up 6-0. The No. 3 ranked team in Class 6A Topeka High was upset by Shawnee Heights, 28-21, in overtime on Friday night. The Trojans built a 14-0 lead in the first half, but fell behind in the fourth quarter as Tony Barksdale Jr. broke a 67-yard touchdown run to give the T-Birds the lead. Topeka High would respond with an Alec Beatty 55-yard touchdown pass to Dante Brooks to tie the game at 21. In overtime, Camden Wheatley scored on a 2-yard touchdown run to give Heights the lead. Topeka High’s possession ensuing possession ended when Beatty’s pass fell incomplete on 4th-and-goal from the five. Barksdale rushed for 185 yards and two touchdowns in addition to catching a touchdown pass. Scott City clinched the Greater West Activities Conference title with a hard-fought, 14-7 win over Ulysses. Cooper Griffith led the Beavers with 195 yards rushing and a touchdown. Trey O’Neil scored Scott City’s other touchdown on a short run in the first quarter. The Beavers held Ulysses back Ian Rudzik somewhat in check. The junior collected 168 yards rushing on 33 attempts. Ulysses scored in the fourth quarter on a 25-yard pass from Braden Scott to Bryce Rodriguez. The Eight-Man, Division II showdown between No. 4 Victoria and No. 2 Beloit St. John’s-Tipton definitely lived up to its billing. Victoria outscored St. John’s-Tipton 68-56 to move to 5-1 and get a leg up in the ultra-competitive District 7 that also includes third-ranked Thunder Ridge. The visiting Knights led by as many as 18 points in the first half after Brady Dinkel connected with Noah Dreiling on a 29-yard touchdown pass and a 30-12 lead. The Blujays would rally to pull within 38-34 at the half. The second half began just as exciting as Bryan Dome returned the second-half kickoff 65 yards for a score and a Victoria 46-34 lead. The Knights stretched that lead to 68-48 on a Lane Kisner 65-yard run with 8:43 left in the fourth quarter. Victoria would hold on from there to win 68-56. Phillipsburg used a huge second half to top No. 5 Sedgwick 49-27 in Class 2-1A. The top-ranked Panthers trailed 20-13 at halftime, but outscored the Cardinals 36-7 in the second half. Stuart Lennemann scored four touchdowns in the second half to propel Phillipsburg to the win. After being tied at 7 at the end of the first quarter, Dodge City and Hays engaged in a wild shootout that resulted in 114 total points. Hays outlasted the Red Demons 64-50. The Indians and Red Demons were tied at 28 at halftime before Hays scored three consecutive touchdowns in the third quarter to grab control. Hays quarterback Alex Delton passed for three touchdowns and rushed for scores of 70 and 51 yards. Dodge City quarterback Caden Walters rushed for two scores and passed for four scores. Maize rallied from two touchdowns down to force overtime against Newton, then shocked the Railers with a touchdown in overtime to escape 42-41. The Eagles trailed 28-14 in the second half before Connor Lungwitz threw two touchdown passes to pull Maize even. The teams would trade touchdowns in the fourth quarter and go into overtime tied at 35. Newton scored first on their overtime possession when Josh Fulmer hauled in a pass from Jack Kingsley that deflected off intended receiver, teammate, Jamel Wagoner. The Railers got a celebration penalty forcing a long PAT that failed because of a bad snap. Maize’s possession began at their 25-yard line after the Eagles also received an unsportsmanlike penalty. On fourth-and-goal from the 25, Lungwitz hit Kendal Stewart in the end zone for the tying score. Alan Sanchez added the PAT to allow the Eagles to escape. Lungwitz passed for 430 yards and five touchdowns. In a battle of unbeaten, Conway Springs grabbed control early and handled Wichita Trinity 42-21. The Cardinals built a 28-7 lead at halftime behind three Luke Fisher touchdown runs and a Luke Ebenkamp interception return for a score. Fisher rushed for more than 250 yards and five touchdowns in the game. Trinity’s star running back Tyler Burns rushed for more than 210 yards and scored two touchdowns. Blue Valley scored two touchdowns in the fourth quarter to top St. Thomas Aquinas, 21-14. After playing to a first half 7-7 tie, the Saints took the lead in the third quarter on a touchdown pass from Karter Odermann to Landon Johnson. Blue Valley would respond as quarterback Colton McCumber hit Braydon Huschka on an 8-yard touchdown pass to tie the game. A few minutes later, McCumber scored from five yards out to give Blue Valley the lead. The Tigers rushed for nearly 300 yards on the night – led by A.J. Totta’s 194 yards on 34 carries. Aquinas was led by James Cosentino’s 102 yards and a touchdown on the ground. Derby exploded for 38 points in the second half to knock 5A No. 2 Salina South from the ranks of the unbeaten, 45-14. The Panthers and Cougars were tied at 7 at halftime before Derby running back Curtis Whitten broke loose after the break. Whitten rushed for more than 200 yards and scored four touchdowns to lead Derby. Jace McDown rushed for more than 200 yards as 4A-II No. 2 Columbus rallied to edge St. Mary’s Colgan 14-12 on a muddy field in Columbus. A first-half interception set up Colgan quarterback Ryan Cedeno’s touchdown run to give the Panthers a 6-0 lead. Columbus tied the game at six before halftime on a 71-yard run by McDown. Cedeno again scored in the fourth quarter to give the Panthers a 12-6 lead. McDown then took over on the ensuing drive and scored from five yards out to tie the game. He then converted the two-point conversion to give the Titans a 14-12 lead. Colgan’s final drive ended in an interception that sealed the game for Columbus. In one of the more surprising results of the night, Peabody-Burns blasted No. 5 Madison 48-0 in Eight-Man, Division I. The Warriors led just 6-0 after scoring with less than a minute to go in the first half. Madison’s Gavin Beyer went down with an injury, and the Bulldogs never recovered. Peabody-Burns poured on 42 more points to claim the big shutout. Congratulations to the Syracuse Bulldogs for snapping a 27-game losing streak with a 40-27 win over Sublette. The Bulldogs last win came on September 30, 2011 when they defeated Satanta 34-14. In addition, Blue Valley North ended a 19-game losing streak with a 31-15 win over Gardner-Edgerton. The Mustangs won for the first time since beating Blue Valley Southwest 31-28 on September 21, 2012.